From the kitchen of One Perfect Bite...Albert Einstein is attributed with saying, "Insanity is doing the same thing over and over again and expecting different results." Sometimes. Maybe. Confused might be a better word for the robin who spends all day, every day, diving into the large bank of windows that front our home. This has gone on for days now, and while we've done everything we can think of to ward him off, he'll keep at it until nesting season is over or he is concussed and falls from the sky. This happens every year and I'm always amazed these confused souls make it through mating season with their small brains intact. I mention this only because I can no longer deny my own recidivist tendencies. The delivery of locally raised meat forced me to access the contents of my auxiliary freezer. A quick inventory revealed that it was packed to the rafters and there was no room for the meat. This, too, happens every year and it's a good thing that Albert isn't around 'cause we all know what he'd say. After some mild cursing, deep digging and inventory analysis, I made space for the meat. The only bizarre aspect of the episode was my freezer wasn't jam-packed with meat or vegetables or survival staples. It was packed to the rafters with bread, berries and nuts. If ever there is a shortage of freezer jam stop by. I have enough of it to feed a small country. At any rate, tucked among the nuts was an embarrassingly large stash of peanuts. So, as you probably have already guessed, I'll be exploring recipes for peanuts for the next few days, and think I'll call the exercise Nuts to You Week in honor of Albert Einstein. While many would call this a refrigerator cheesecake, I think it's more like an old-fashioned Charlotte or an ice-box cake. While it contains cream cheese, its texture is mousse-like and completely different than that of a cheesecake. The recipe, which comes from The Peanut Institute, is one of the easiest I've ever come across and even beginning cooks will be able to make it successfully. The Silver Fox made the cake that I photographed for this post. I've made no changes to the original recipe, but I do have a couple of suggestions should you decide to make it. I freeze the cake and slice it while it is frozen. This mousse-like cake is very soft, and in a perfect world it would benefit from the infusion of a bit of gelatin. The use of gelatin would, however, move the cake from its super easy status, so freezing it is the way to go if you want clean slices. Once it's cut, it has enough substance to stand on its own without drooping. I let the frozen slices sit in the refrigerator for an hour or so before serving. If I'm in a real rush 30 minutes at room temperature will also do the trick. This obviously is not gourmet fare, but it's a really nice dessert that's suitable for guests as well as family. If you like peanut butter desserts, you'll love this one. Here's the recipe. 1) Combine peanuts, graham cracker crumbs and melted butter. Press crumb mixture into 9-inch spring form pan. Chill crust for 20 minutes. 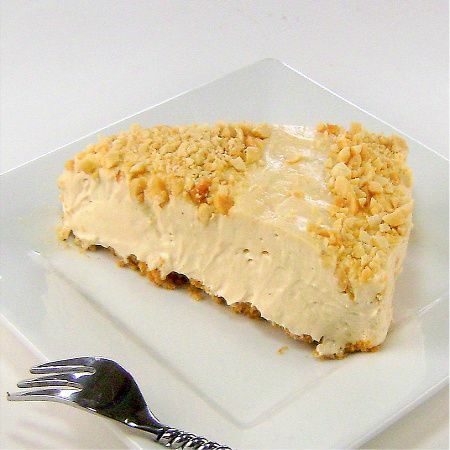 2) Using an electric mixer, cream softened cream cheese and peanut butter until fluffy. Gradually add condensed milk and mix well. Add lemon juice and vanilla and blend well. Fold in whipped topping. 3) Pour mixture into prepared crust. Garnish with chopped peanuts. Chill 2-3 hours or freeze. Makes 12 servings. I am looking forward to seeing more of your peanut recipes. That silly little Robin! Oh man I am a magician with reorganizing the freezer!!! That icebox cake looks like a great treat...one I will definetley put in my Summer cooking list! this looks so creamy and smooth...amazing! Frozen like an ice cream must be amazing... but can you even just chill it? Not to soft? I love this and the idea of the texture being between a cheesecake and a mousse. Beautiful! Simply mouthwatering,cake looks extremely addictive.. I'm so much craving for that slice now, looks very delicious. You're right it's really simple. p.s-Today is your day at my blog. I love the idea of freezing this. My grandkids will love it. Thanks for sharing. I'm craving for that slice now..yum! We have a robin that does that every year. Well, I've decided it is the same robin. Anyway, it just upsets me so when he hits the window. Your icebox cake is so pretty and it sounds like it is the perfect dessert for a hot summer day or any day. kisses and have a good week my friend!! What a lovely presentation of a decadent dessert! Mary you are a lovely cook, your creations are so tempting and delicious. I like this dessert, love it when it's cold, so good! Icebox cakes are the cakes of our grandmothers but am glad to see them coming back for they are really good! I had noticed that nuts were definetly prevelant in your cooking lately.This does look wonderful Mary! Wow your appetizer looks gorgeous. Very tempting just want to have a bite. Looks so creamy and so delicious, what a nice treat this would be! "If you love peanut butter?" Am amazed that someone would not be craving this. Must check my freezer for peanuts! Rich and satisfying and you know I love ease. And note to self: check freezer before ordering meat. The cake looks amazing! Refrigerated cheesecake, ice box cake, whatever you call it, I'd eat the whole thing!! i love easy desserts - this looks like a great recipe to have on hand. I'm going to have Andrew read this post. He thinks we are the only ones with packed freezers. He also might make this cake since there a large tin of Virginia peanuts nestled among the other necessities in said freezers. We have an abundance of crusty bread on ice. Perhaps we should meet somewhere--you and your jam and me and my bread. Anyone out there with an abundance of sweet butter wanting to come along? Awesome recipe...melt in the mouth look...and wonderful taste of peanut...slurp.. I love easy desserts like this, especially in the hot summer months when I don't want to bake. If I lived close to you Mary, I'd be over for some of your freezer jam; it's the best tasting jam there is. I'm loving. You have very good recipes and pictures are beautiful. Hi Mary, I like the look and sound of this peant butter ice-box cake. I can taste the peanut butter flavor;-). Beautiful presentation too! I love ice cream-type cakes but hate to buy them, so I'm always happy to have a new recipe. This one will be for Saturday supper. The whole peanut story is hysterical, Mary, but good thing you'll be coming up with peanut recipes because I love peanuts. And this pie is wow! I want a slice now. Creamy, peanutty, you don't even need the crust, just pass me a spoon. Fabulous! This is GORGEOUS. I am so impressed. Wow - it looks fabulous, although until I make it I'll maintain your best cheesecake is the Cranberry Layered one. It is stellar! That looks so good. I love everything that has to do with peanuts and peanut butter (or any type of nut) and this is a must try. And I have to say, I'm really looking forward to your future nuttiness as you eat away at your peanut supply :). I'm loving peanut week! And, I'll take any tips on how to organize a chest freezer. Mine's a mess! deeeeeee licious! What is not to love? Oh heavens, you are killing me with all this goodness. I am hungry now. Looks interesting. I've only ever heard of the ice box cake with the chocolate wafers, so this is different! This is a lot like peanut butter pie. It's prettier, though! BTW, Mister is still raving about that peanut butter fudge. I put a copy in my book of favorite recipes. I will be making it again! Wow that is one delicious cake! Looks fantastic! I love the circle pattern of the peanuts on top! I am absolutely SO thrilled that you'll be writing about peanuts for a while because I absolutely love them! I've never had or made an ice-box cake, but now I'm really craving one! That poor bird! I hope it figures things out soon. Beautiful cake. I adore peanuts and this looks like it would hit the spot. Ice box cakes always make me think of June Cleaver! Secret confession- I've never had or made one. Man oh man does that look good! And I'm not even the bigest fan of cheesecakes or peanuts etc but I really want the biggest slice I can get my fangs around! Mary, this would be a refreshing cake!! Our Germans friends who always had trouble with birds flying into the windows, but large silouettes of blackbirds made out of black paper on the inside of the windows. It seemed to help to scare the birds away. But on the other hand, this happens all the time, so I guess the birds just have to learn the hard way!!! Hello Mary, I got to know your blog through the blog today and of course Ana Rita came ca see your recipes, I was a fan, you have wonderful recipes, so I have to say thanks to Ana Rita for having given you to know, because I go back many and often more, since you then go'm watching the news. If you want to also pass on my corner! I always have a huge stash of peanuts too! I love the the little babies! The Silver Fox did a wonderful job with this dessert I must say! So it sounds like it's not nearly as heavy as a 'cream cheese cheese cake' - nice! Thank you so much for coming over to my blog and putting in such a sweet comment! In the next few days i hope to catch up on my "blogs to follow" and hope to check out yours! Thanks again and hope to see you lot's! Ha, Ha, I'm glad I'm not the only one with a packed freezer! I think its the sign of a person who really loves to cook. :) This ice box cake looks fantastic. Perfect now that the weather is getting warmer! Mary- Your post about the robin and the contents of your freezer really tickled me. My freezer explodes on me when I open it. Frozen food just rains on me every time. The peanutty ice-box cake looks wonderful. I've one similar to this and it is a real favorite with my family. cream cheese and peanut butter sounds like an amazing combination. what a velvety delicious looking cake! Love the title of your week too. How cool is that??? Thanks for reminding me, I need to tackle that freezer!!! Jaw dropping! I am printing this recipe to make strait after lent! I love the creaminess of this dessert! It looks soooooo good! How nice it was to read that your Mr. has a hand at treating to something sweetly made and talented too! OMG my partner needs to go on vacation so that I can give this a whirl...silly peanut allergy! I have the same problem with my freezer! Live teh Nuts to You Einstein theme. 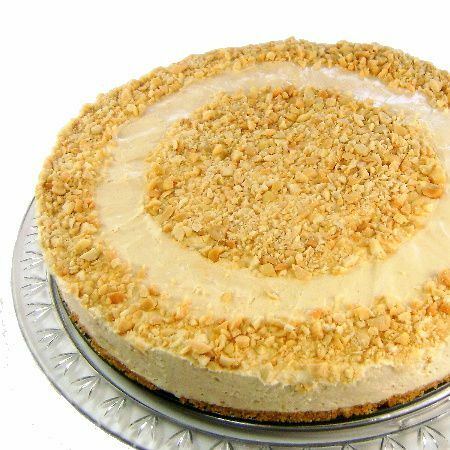 Looks like you found an excellent soultion for your peanut broblem- the cake looks delish! Oh my gosh. This looks delicious. I love lemon but am wondering what it adds to the recipe's taste. I love the sounds of this. Such a short and easy ingredients list! This sounds so good and I can't wait to make it! I'm loving me some no-bake recipes...makes me think the cold and rain will stop soon and I'll have some warm weather. Your blog is so lovely! I'm not sure how you found mine, but I am so glad you did because now I have found you. This recipe is a lot like one my family makes and I adore it. What could be better than chocolate and peanut butter. I look forward to more wonderful recipes. I've really enjoyed all these peanut recipes! You are using them in amazingly creative ways. I must bookmark this cake - we're getting into barbecue season and this is a great dessert to take!